Guys...I've found the outfit I'm going to live in for the next year without shame: a Helmut Lang cowl blouse paired with Intimint lounge pants. It's a lazy effort for an effortless look (actually embracing the meaning of the covetable style), with just enough nonchalance. If hygiene and laundry didn't matter in this world, I'd be wearing this to bed and out, always. Ahhhhmazing! 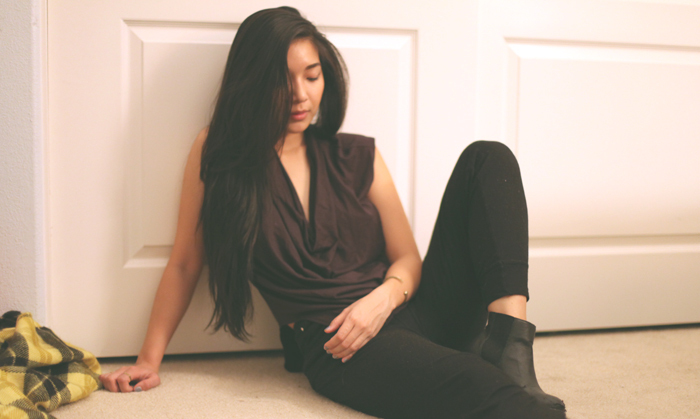 Love this easy look that is put together yet comfy. Gorgeous...love the slouchy silhouette and the fact that comfortable is now en vogue ;) I just discovered your blog through your Lucky feature...didn't know you were a fellow OC girl! Newest follower/fan...can't wait to see more.